Crop image using jquery and codeigniter framework. 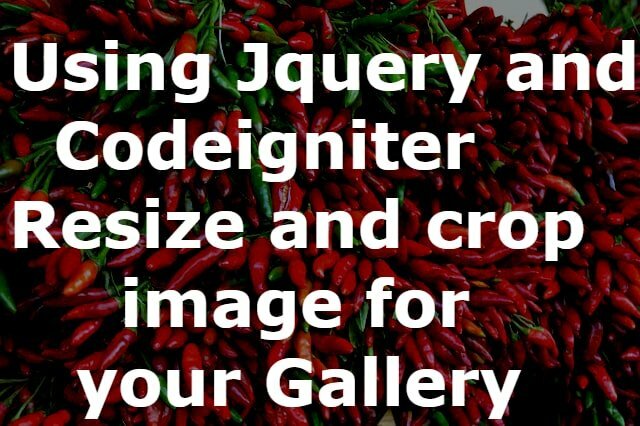 Today I will explain how to crop the image using jquery and CodeIgniter framework. For this, I used imageareaselect.js jquery plugin and imgareaselect-default.css files.If you are creating crop image functionality for profile pic updates and your application is getting high traffic , you need to take good Virtual Private Servers, Built for Open Source Developers, Fully managed, lightning-fast, starting at $15/mo with 1GB RAM!, a developer running a complex application that requires instant scalability, or a designer wanting to give your clients’ sites maximum performance, then VPS hosting is just what you need! This request will call model function to upload a file using codeigniter default library upload. READ How to retrieve data from mysql and display in codeigniter view? Now we will look up model functions to upload image file to uploads folder and saving file name to database. In the above code, I used a upload thumbnail () function to create crop image into uploads folder and save it to the database. Here to create thumbnail I had taken selected image x-axis, y-axis, height and width of the selected image areas dimensions. How to fetch form data using Angularjs and display in codeigniter view? You need to be a part of a contest for one of the greatest sites on the net.